Growing up on a dairy farm, Trent learned the value of hard work at an early age by working the land and helping milk cows alongside his dad. To this day, out of habit, Trent still rises early and continues his hard work as our conservative State Representative. Since we elected him, Trent has built a rock-solid reputation as a champion for fiscally conservative budgets, lower taxes, private property rights, and strong rural values. Trent has served on the House Appropriations Committee for all three of his terms in Austin, and has twice been selected as one of five House members to negotiate the final state budget. A former local School Board president, Trent has been the lead negotiator for the House on education funding in the two most recent sessions, working to fund critical programs at our primary and secondary schools, and our state’s institutions of higher learning. Trent comes from a family of educators. He knows exactly how an education can change lives. He has also held a seat on the House Natural Resources Committee in his first three terms, once serving as Vice Chairman. Trent has helped lead the efforts to ensure our state’s water policies are sensible and support economic growth. He has played an instrumental role in funding our State Water Plan, as well as helping to defeat legislation that would have made it easier to move vital water resources out of our region of the state. Since we elected him, Trent has voted to cut property taxes, strengthen our 2nd Amendment rights, reduce the business margins tax, double our state’s resources to secure the border, end budget diversions, and eliminate $200 million in professional licensing fees. He was voted “Freshman of the Year” by the Republican Caucus in 2013 and was recognized by Capitol Inside as “Most Valuable Sophomore” after the 2015 session. Trent’s rural and agricultural roots run deep. Growing up on a farm, Trent was very active in showing cattle throughout his youth. He also participated on the rodeo circuit as a calf roper through high school. During his junior year of high school, he was elected Texas 4-H President, and his senior year he was chosen to serve as a Texas FFA State Vice President. A 1995 graduate of Texas A&M University with a bachelor’s degree in Agricultural Economics, Trent bleeds maroon. While at A&M, he was elected to the Student Senate, Class Treasurer, and Yell Leader. During his senior year, he was also elected by his Aggie classmates to serve as one of three Class Agents, a position he held until he stepped down in 2005. He continues to be involved with his alma mater through the Texas A&M Letterman’s Association and Association of Former Students. Prior to being elected to the Texas House, Trent served as president of a regional title company and as the first-ever Executive Director of the Texas Forest Country Partnership. He also served for over 5 years as a member of the Lufkin ISD Board of Trustees – his last two as President of the Board. Today, Trent is the Angelina County Chairman for Citizens National Bank. For his record of delivering results in support of free market principles, a healthy and educated workforce, and efficient government, Trent was named a “2017 Exemplary & Effective Conservative” by the Conservative Roundtable of Texas. Much like working the land, Trent believes it takes hard work, grit, and a good attitude to get conservative results. Trent often says, “Those who work the hardest are the most likely to succeed.” Whether he’s on the farm, at the bank, in the House Chamber at the Capitol, or here at home, that’s what you’ll find Trent doing. 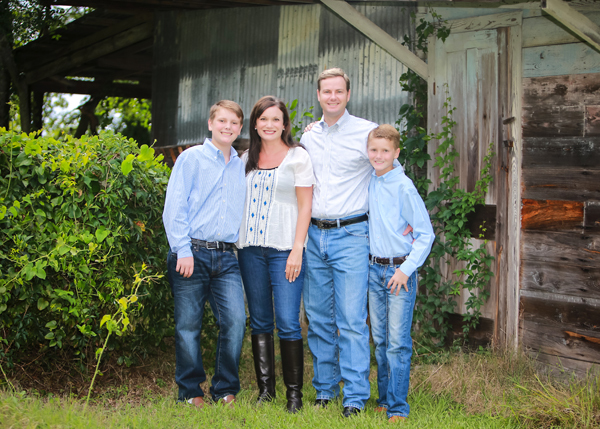 He and his wife, Nickie, live in Lufkin with their two sons – Garin and Grant. Both he and Nickie are very active in their boys’ schools, their community, as well as their church, Harmony Hill Baptist Church.